Cadillac said a couple weeks ago that he had to go to Bakersfield to audit some offices. At first I thought he’d become a Scientologist (da-dum-dum!) but then learned he had to go look at paperwork in credit unions and banks or something like that. I don’t really know. He starts talking about work, which is mostly about financial regulations and financial products and who should get what and why; and I nod and daydream about cupcakes. Then he asks why I’m drooling. This time, I thought, Oooh, Bakersfield! Why, you ask? Because Russo’s Books is there. We stopped there on the way home from the Sequoias, so I asked if they’d host a signing, and they said sure, why not? The Bakersfield Californian wrote up an article. Here I am with a lady who lives in Bakersfield and who went to college with my inlaws and high school with my husband’s uncle. 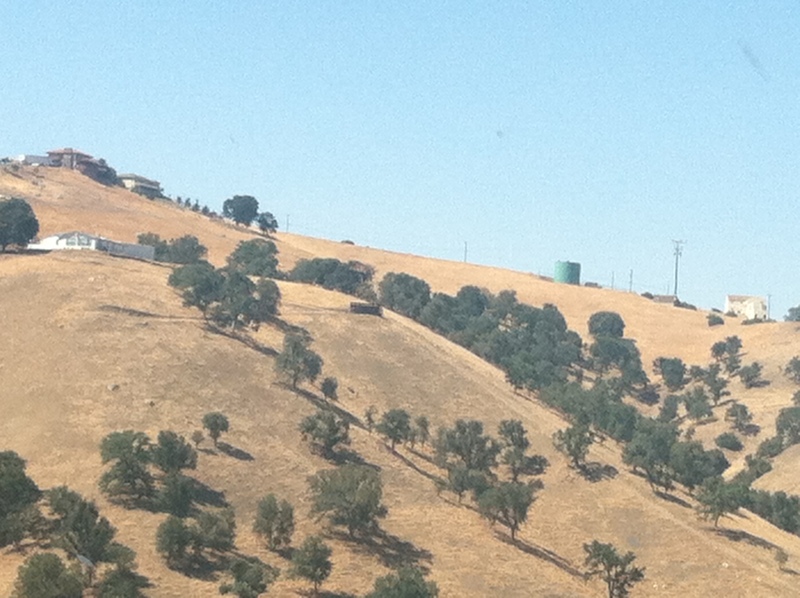 We traveled up the 15 because we had to go to Tehachapi first. Everything was dry and yellow and tree-studded. Cadillac said he wanted to hike some of the hills and we should come back to do that, but though I like it as a photo or a painting, it sounded kind of dusty to me, with not much to see besides cows and maybe a snake. What is in Tehachapi? Well, if you are a “train chaser,” you go there because there’s some kind of big train junction. By train chaser, I mean somebody who likes to drive after trains and take photos of them as they pass by. (Do people really do that? Yes, they do.) Cadillac had to visit a credit union. 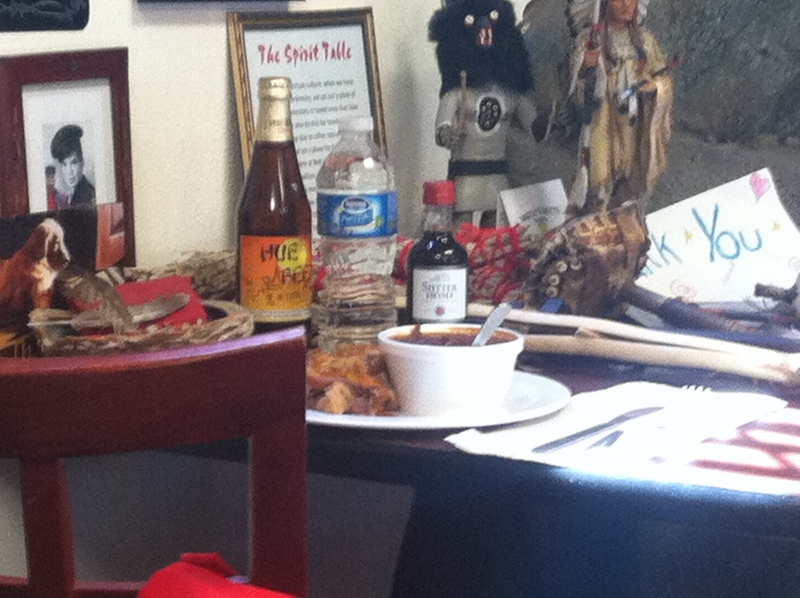 In Tehachapi, we went to the Red House BBQ, which I found because I looked up “fry bread” and they served it. My MIL’s had fry bread on her trips through the SW and raved about it. 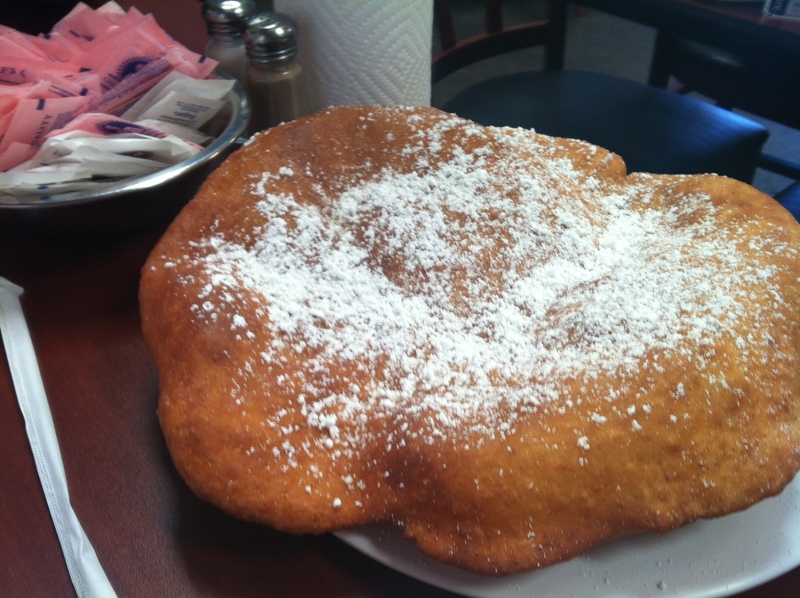 Plus, I read about fry bread in Sherman Alexie’s work and I wanted to try it. The first thing I saw was this. They have a “spirit table” with food for those who have passed on.You can’t see it in this photo, but the wall near it is a wall full of photos of service members. They also fly the flags of each Armed Forces. The barbecue has its own smoker in the back, and their food was great. This is the small pulled pork sandwich, which I got with corn (obviously, said Professor Snape). It comes with a honey mustard sauce instead of the red BBQ sauce. Cadillac got the brisket, which had the red sauce on it. It was all delicious but despite being small was huge. Then we tackled the fry bread. You can get it with honey and butter, or powdered sugar; or done up as a taco. It’s kind of like naan, but it’s made out of a hearty wheat. It was really delicious. Fried anything is delicious, isn’t it? It was huge and could have been a meal by itself. We took most of it to go. If you are ever in the vicinity of Tehachapi, you should go here. 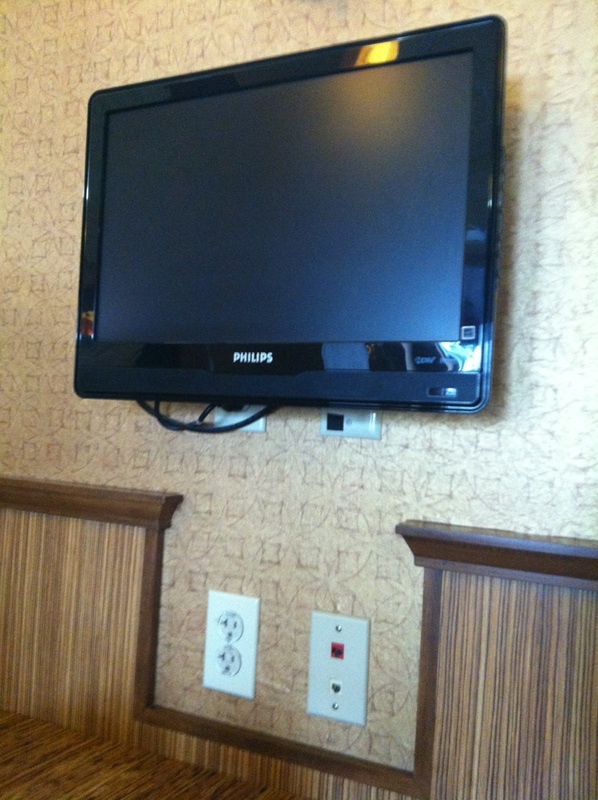 At the hotel where we stayed in Bakersfield, the restaurant had its own individual televisions in each booth, so you don’t have to talk to people. Great for families! Never talk again! Ha ha. We had breakfast there but didn’t turn it on as a matter of principle, darn it.